Minority-owned (POC) Tattoo Shop in Portland, OR. 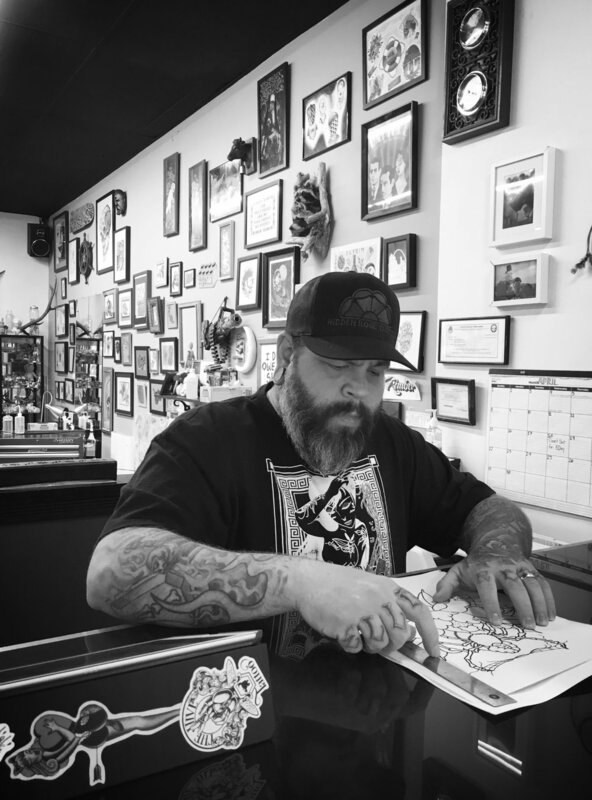 Learn more about us, our shop and the tattoo artists. Tattoo 34 on Hawthorne is a Minority-Owned (Native American, First Nation & Black), Women-Owned and run, and Family-Owned Tattoo Shop, located in the heart of Portland, OR's popular and eclectic Hawthorne district. The shop is open seven days a week from 12pm until 8pm. We take walk-in’s daily. Morning appointments can also be scheduled with certain tattoo artists. We are a street tattoo shop, which means we welcome walk-in's and have flash sheets to choose a design from but our tattoo artists also specialize in high quality, custom drawn pieces. The tattoo shop is wheelchair accessible. Our tattoo shop is our second home and another family to us. We treat our clients with compassion and respect and strive to give everyone the best experience in a comfortable and positive space. Our goal is to create a unique, inviting and fun environment, while doing the best tattoos. In addition to tattooing, we also have gallery shows and art nights at the tattoo shop. Please see our EVENTS PAGE for more information and come be a part of our community. Come on in to our Tattoo Shop! You are always welcome to come in to our tattoo shop on Hawthorne Blvd! Come feel the vibe, check out the portfolios and talk with our tattoo artists about your vision. We do take walk-in’s daily. Our tattoo artists do a variety of tattoo styles and they have many different artistic backgrounds. Check out their info so you can select a tattoo artist who can best complement your tattoo idea. If you need help matching your vision with the perfect artist, come in and chat! Our tattoo artists want our clients to get the best tattoo with the best experience. If a tattoo artist doesn’t feel they are the right fit for what you are looking for, they will let you know and can recommend a different tattoo artist. You can browse each tattoo artists portfolios on their artist page (under the Artist tab), read about their experiences, and find out the best way to contact them. Each of the tattoo artists is responsible for scheduling and keeping their own appointments (if you have any concerns, please let management know). Most of the tattoo artists can schedule you an appointment in a responsible time frame. We are a wheelchair accessible tattoo shop. Once at our tattoo shop, if you are waiting for a walk-in spot, your tattoo artist to draw or just have time before an appointment, Hawthorne Blvd is an amazing place for walking, food and shopping. We are an open-floor tattoo shop and enjoy the community and conversations that it brings. Everyone is welcome here. When you are in our tattoo shop, please do be aware of the space and people around you. We do not tolerate racism, sexism, hate speech, or other discriminatory attitudes. Walk-in’s welcome! Our shop minimum is $80, so no matter how small your tattoo is or how quickly it is completed, that is what you will pay. If what you want is larger than the size of a quarter, expect to pay more. Be prepared to pay $80-$100 for a “simple” design. We charge by the hour and the shop hourly rate is $150. To get an accurate price quote, come in and talk with your tattoo artist in person (see "Free Consultation" below). Trying to give a quote over the phone, in a text, or email will NOT give an accurate price, the tattoo artists need to see the style of design, understand your vision and where you want it on your body. Our tattoo artists are that, Artists and they want to give you a lifelong piece of art. If one of your tattoo artists has suggestions on size, placement or composition, please consider what they are saying. We only have experienced tattoo artists in our tattoo shop, who we trust to have your best interests in mind. If you are on a budget simply let your tattoo artist know and they can work with you to figure out what works best. To purchase a Gift Card you can come in to the shop or for an instant eGift card click here. It's a must and free! If you are getting a larger tattoo, custom piece, something really detailed, or a cover up, come in to the tattoo shop for a free consult. You are welcome to walk in and see if it's a good time to go over the details of your tattoo idea with your tattoo artist, however if you don't want to wait we recommend you set up an appointment. If you are coming in from out of town and have limited time, let us know! A free consult gives the tattoo artist the opportunity to trace your body part where the tattoo will be, to confirm the artwork that they will be spending their time drawing for you, and to give you a price quote. This is still only a quote, depending on later changes and how well you sit during the tattoo, the price can change. Let your tattoo artists know during the consult if you have any medical conditions such as skin issues, blood borne illness’, or allergies. This will not stop you from getting a tattoo at our shop or subject you to discrimination. With more information our tattoo artists will be able to work with you better and can prepare adequately for the tattoo day. If you have any concerns, always consult with your doctor first. Please bring any reference pictures (preferably printed images) to give your tattoo artist and be prepared to pay your deposit. For tattoos on an intimate area, we may be able to schedule you a before or after-hours appointment for less exposure, please inquire with your tattoo artist during your consultation if this is a concern. *Hand, neck, and face tattoos are done on a case by case basis and at the tattoo artists discretion. 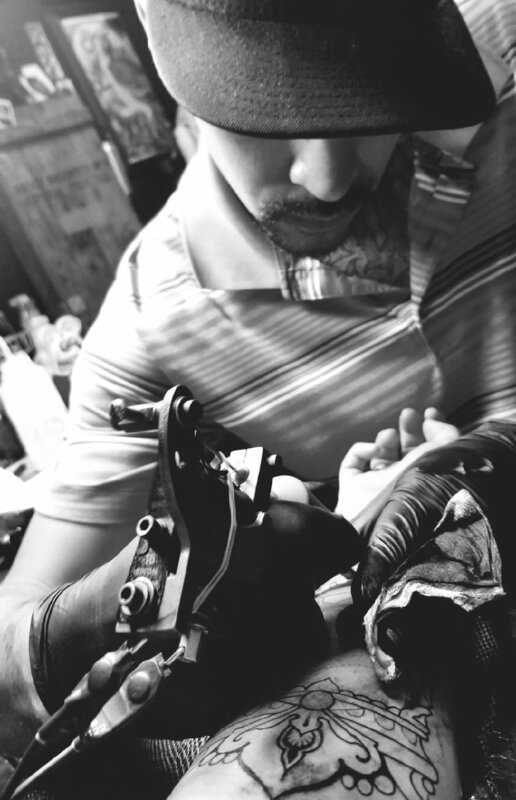 Our tattoo artists work hard for you and apply hours towards a custom piece. Deposits protect our artists time, labor and schedule investment. Deposits can be paid in our tattoo shop or by an email invoice. We check ID (a valid state or government issued picture ID or a valid passport with a picture), you must be 18. No exceptions. Our tattoo artists will not tattoo you if you are under the influence of drugs or alcohol. You can not be pregnant. Arrive sunburn and illness free. Please confirm you are not regularly taking blood thinners (they have many different names). Please talk to your tattoo artists about any health issues or concerns, such as but not limited to: if you faint easily or are allergic to adhesives. If you have any concerns, always consult with your doctor first. Everything is better when you are well rested, have eaten, are hydrated and have had only minimal caffeine. Please make sure you shower and wear clean clothes (infection prevention starts there). At the tattoo shop, your tattoo artists will shave the area for you. We do not mind if you have someone with you. We want you to be as comfortable as possible and understand the importance of this, however space is limited and we can not guarantee they can stay next to you the whole time, but the lobby isn’t far. We love children but please make other arrangements for them during your tattoo appointment. Your price quote is given based on the assumption you sit still during the tattoo. Your tattoo artist can work faster and more efficiently if you hold still. If a session is longer than expected your price may be higher. Be sure you understand how much you are being quoted for your tattoo and be prepared to pay more, should it become necessary (we do take credit cards). Please DO NOT try to barter. Depending on the placement of your tattoo, you may be required to remove certain items of clothing. To make things more comfortable for you, bring other clothing items such as a bathing suit top or shorts. We are an open tattoo shop, though we do have dividers if more privacy is your preference. Your tattoo artists strives to make your experience exceptional. If you are happy with your tattoo and the service your tattoo artists provided at our tattoo shop, a tip is greatly appreciated. The tattoo artists only receive a percentage of the cost of your tattoo but all of the tip! Tips typically range from 10-30%. A cash tip is preferred, but not necessary. When the tip is cash (even if you purchase the tattoo with a card) it can go straight to your tattoo artists and they don’t have to wait for it. Another great way to support your tattoo artists and recognize our tattoo shop is to review us on Yelp, Google, and/or Facebook and share your tattoo and experience on your social media platforms. We also love Instagram! If you think we can improve or you have concerns please let management know. Nisha and Toby are the Owners of Tattoo 34 and Kimber is the tattoo shop Manager. All contacts are on our CONNECT page. Thank you for supporting our small, minority owned, tattoo shop (POC business) on Hawthorne Blvd in Portland, OR! Take care of your Tattoo. Our trained and licensed tattoo artists take every precaution to prevent infection. If you do not take proper care of your tattoo after leaving our chair, it can easily become infected. Your tattoo is a wound, keep it clean! For the best outcome, keep it out of the sun until it is healed and then use sunscreen. Any form of tanning can damage and fade your tattoo. Your aftercare affects the healing process and quality of your tattoo. If you have any questions please do not hesitate to contact us at the tattoo shop. DO NOT submerge your new tattoo under water. No swimming, soaking or sauna. As your tattoo heals it may loose some ink, due to the natural way skin heals or because of poor care after the tattoo. Your tattoo artist can tell you by looking at it if it needs to be touched up. Feel free to contact your tattoo artist or come in to the tattoo shop. If you cared for your tattoo properly and followed the After Care Instructions (above), the same tattoo artist who did your original work is happy to touch up your tattoo for free, within the first 30 days. *Exceptions if you live out of the area or healing time is longer than expected, communicate with your tattoo artist and we can work it out. Your tattoo must be completely healed before a touch up will be done (about 2 weeks). If you want to add some elements or new color to your tattoo, that is not a touch up and you will need to pay your tattoo artist for the additional work. Join our email list for shop specials and events. Don’t worry, we do not email often! Subscribe for shop info & specials! Tattoo 34 is a POC minority owned (Black owned, African American owned, Native American owned, First Nations owned) Tattoo shop on Hawthorn Blvd in Portland, OR. We take walk in tattoos everyday. We have male and female tattooers that do all styles of ink: neo-traidional, traditional, black and grey realism, illustrative, color, 3D tattoos, biomech, dot work, tribal, new school, skool, bold, delicate, fine line, lettering, script work, geometric and custom ink.